The cast and crew of Supernatural got together last night to celebrate the 300th episode of the hit TV series. Jared Padalecki and Jensen Ackles along with the rest of the cast and crew posted pictures of the event last night, taking time to thank the fans who have been with the show since it first aired on the now defunct WB network in 2005. It's been a crazy 13 years, and the show has only gotten bigger, cultivating a rabid and loyal fan base. Supernatural is currently in the middle of Season 14, and the 300th episode won't air until sometime in 2019. The red carpet event took place in Vancouver, with the cast and crew all dressed in nice suits and formal wear. It's crazy to think that the show has lasted through 14 seasons, especially considering that it survived the UPN/WB merger and that there are currently only 21 shows in television history to make it to 14 seasons. Jensen Ackles had this to say about the achievement. "Thanks to everyone who helped us celebrate 300 episodes last night. And a special thanks to all who helped us get there. Love you all. What a ride!" 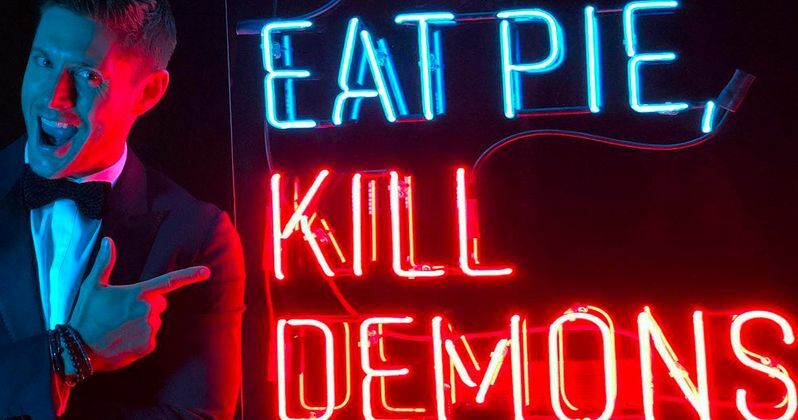 Jensen Ackles posted a picture of himself next to a neon sign, which read, "Eat Pie, Kill Demons." The actor said that the sign was "like the Dean Winchester bat signal... but neon." This little mention of the bat signal will more than likely start more speculation about the actor turning up in the Arrowverse Elseworlds crossover event as Batman. The actor was spotted on the set a few weeks ago and fans automatically assumed that he was playing the caped crusader, but the rumors have been denied. In addition to Jensen Ackles and Jared Padalecki, Misha Collins (Castiel), Mark Pellegrino (Lucifer), Alexander Calvert (Jack), Samantha Smith (Mary Winchester), and Ruth Connell (Rowena) were all on hand to celebrate Supernatural's 300th episode. If the CW ends up ordering a Season 15, which they probably will, Supernatural will be one of only 12 shows to make it that far, which is pretty huge. Let's hope that announcement from the network is made shortly. Though Supernatural first aired in 2005, it was in development for a decade before that. Show creator Eric Kripke spent years unsuccessfully pitching the series to network after network, who all passed on his idea. When the WB picked it up, it immediately had strong ratings, with the pilot watched by over 5 million people. The original idea was to only have three seasons of the show, which was then changed to five. After the fifth season, the original storyline concluded and Kripke exited as showrunner. Now, 13 years, later and the show just filmed its 300th episode for Season 14. You can check out some pictures from the Supernatural event below, thanks to Jensen Ackles' Instagram account.